DARA O’BRIAIN: £24.50, 8pm and Oct 13, Brighton Dome (01273) 709709. Voice of Reason show. GARY DELANEY: Gagster’s Paradise. £18.50, 7.45pm The Hawth Theatre, Crawley (01293) 553636. KRATER COMEDY CLUB: Until Oct 14, 7pm/8pm/10.30pm, £5-£36.50 Komedia, 44-47 Gardner Street, Brighton 0845 293 8480. AUTUMN FISH AND CHIP SUPPER: With readings £12 per ticket, 7.30pm-10pm. Barnham Community Hall, Yapton and Barnham SNU Spiritualist Pioneer Centre. LEWESLIGHT: Festival of Light celebrating culture, history and the environment in and around Lewes until Sunday, 7pm-10.30pm. LEWES RIVERSIDE CLUB: Maffia and I Conquered Mt Etna by Anne Chance, 2pm St Thomas’ Church Hall, Cliffe, Lewes. DIABEL CISSOKHO: £10, 7pm Komedia, 44-47 Gardner Street, Brighton 0845 293 8480. With African Nights DJs. DOWN FOR THE COUNT SWING ORCHESTRA: £18-£19, 7.30pm Chequer Mead, East Grinstead (01342) 302000. ONE NIGHT OF QUEEN: From £22.50, 8pm Pavilion Theatre, Marine Parade, Worthing 01903 206206. Performed by Gary Mullen and The Works. THE CARPENTERS STORY: £25.50-£27, 7.30pm The Hawth Theatre, Crawley (01293) 553636. THE MUSICAL BOX: From £26.65, 8pm Theatre Royal, Brighton 0844 871 7650. A Genesis Extravaganza. THE THREE DEGREEES: £26.50, 7.30pm The Royal Hippodrome, Eastbourne (01323) 802020. TOTAL STONE ROSES: Free, 7.30pm Lewes Con Club, 139 High Street, Lewes 01273 473076. THE GREATEST SHOW: £17-£21, 4.30pm/7.30pm White Rock Theatre, Hastings (01424) 462288. Songs from Hollywood. BOOK FAIR: Paws and Claws Book Fair, 10am-4pm Lewes Town Hall. 40 dealers, refreshments available. THE PASTORES ENSEMBLE: Free with retiring collection, 5.30pm St Laurence Church, Falmer. Returning with their programme Diverse Musicke for Different Tymes, usic from 16th to 20th century. CODA: £12, 7pm Komedia, 44-47 Gardner Street, Brighton 0845 293 8480. A tribute to Led Zeppelin. LEWES SATURDAY FOLK CLUB: £12, 8pm Elephant and Castle. Jim Causley in Concert (Lewes Folk Festival). RALPH MCTELL: £27, 7.30pm The Royal Hippodrome, Eastbourne (01323) 802020. ROBINSWOOD: Folk and acoustic band. 7.30pm, St John Church, Lower Church Road, Burgess Hill. A Sussex based folk band playing a selection of traditional, Irish and some compositions. Tickets £8 available from Town Help Point, Parish Office and on the door. THE JOHNNY CASH ROADSHOW: £22, 7.30pm Chequer Mead, East Grinstead (01342) 302000. Tribute show. MUSIC AND IMPROVISED COMEDY: £4-£8, 8pm Latest MusicBar, 14-17 Manchester Street, Brighton (01273) 687171. World Mental Health Day Benfit. TANYALEE DAVIS: £7.50-£10, 8pm Komedia, 44-47 Gardner Street, Brighton 0845 293 8480. Actual Size show. BEACHY HEAD RAMBLERS: Friston Forest and Cuckmere Valley, 10 miles with Linda O 07765 834766. Meet in North Street, Alfriston, outside the village school, 10am. TALK: Farming the Railway Land by Dr John Parry, 3pm Linklater Pavilion, Railway Land, Lewes. Free entry. BRIGHTON PHILHARMONIC ORCHESTRA: £12.50-£39.50, 2.45pm Brighton Dome (01273) 709709. Conductor Barry Wordsworth, with the Brighton Festival Chorus. CLIFF RICHARD: £15.50-£16.50, 3pm Chequer Mead, East Grinstead (01342) 302000. 60th Anniversary Tour filmed live from Manchester. CHANCE TO DANCE: £12-£13, 4pm The Hawth Theatre, Crawley (01293) 553636. Local dance school and dance clubs. WALK: Meet 10am on the green opposite The Parrot Inn, Forest Green, RH5 5RZ. 5.5 - 6 mile HDC walk passing Lukyns and North Breache Manor. 16 stiles. 2 steepish inclines. Stunning backdrop of Holmbury and Pitch Hills. Can be muddy. No dogs please. Lynne 01403 268157. STEADY HOLIDAY: £6, 7.30pm Komedia, 44-47 Gardner Street, Brighton 0845 293 8480. Plus Malena Zavala. THE ROBERT CRAY BAND: £29.50-£39.50, 7pm De la Warr Pavilion, Bexhill (01424) 229111. With support from The Mike Eldred Trio. MAYERLING: £14-£16, 7.15pm The Hawth Theatre, Crawley (01293) 553636. Royal Ballet Live. RAIN MAN: From £13.90, 7.45pm until Oct 20 (Thurs/Sat mat 2.30pm) Theatre Royal, Brighton 0844 871 7650. Based on the Oscar winning film. ROSE AND ROSIE: Overshare. £28, 6.30pm Komedia, 44-47 Gardner Street, Brighton 0845 293 8480. Live screening of their feature-length documentary. RUBY WAX: From £23.50, 7.30pm and Oct 16, Pavilion Theatre, Marine Parade, Worthing 01903 206206. Ruby Wax, The Monk and The Neuroscientist. LAUGH SHACK: £5, 8pm Komedia, 44-47 Gardner Street, Brighton 0845 293 8480. Try-out night. HORSHAM HOLISTIC HEALTH: Mind, Body & Spirit group. Talk – Energy Enhancements, Tips and Techniques with Nikki Barrett at 7.30pm at the Friends Meeting House, Worthing Road, Horsham. Cost £7. Contact Tina on tina@rainbowoasis.co.uk or 07857 545 678. MID SUSSEX RAMBLERS: Handcross and Staplefield, 7.5 miles with Brian J (07985 201335 on day). Meet at Handcross High Street car park, 10am. WALK: Meet 11am at the Steyning Health Centre, Tanyard Lane. BN44 3RJ. 2 mile circular HDC Health walk taking in parts of the village and its outskirts. 1 stile and some small inclines. Can be muddy. Sensible footwear please. Dogs on a lead. 1 ¼ hours. Ann 01903 297553 or Jacky 01903 815543. JACK WHITE: From £43.50, 6.30pm Brighton Centre 0844 8471515. NEIL OLIVER. THE STORY OF THE BRITISH ISLES IN 100 PLACES – TOUR 2018: 7.30pm, £23.50, The Capitol Theatre, Horsham, 01403 750220. BLOOD BROTHERS: £30-£37.50, 7.30pm until cot 20 (Wed/Sat mat 2.30pm) The Hawth Theatre, Crawley (01293) 553636. MISS JASON’S HOUSE PARTY: £5, 7pm Latest MusicBar, 14-17 Manchester Street, Brighton (01273) 687171. The Great British Gad About. PERFECTLY IMPERFECT WOMEN: £10-£12, 8pm Komedia, 44-47 Gardner Street, Brighton 0845 293 8480. With storyteller Danyah Miller. 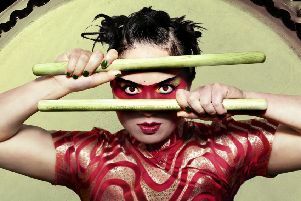 THE GIANT KILLERS: £15, 7.30pm White Rock Theatre, Hastings (01424) 462288. The true story of football’s greatest underdogs. HAL CRUTTENDEN: Chubster. £18, 8pm Komedia, 44-47 Gardner Street, Brighton 0845 293 8480. STAND UP AND SLAM: £5-£8, 8pm Brighton Dome (01273) 709709. Stand-up comedy and poetry. BEACHY HEAD RAMBLERS: The Downs in Autumn, 12 miles with Geoff and Jackie 01323 730915. Meet in Eastbourne Youth Hostel car park (off A259) 10am. LEWES FOOTPATHS GROUP: Rodmell, 5.5 miles with Vivien 07771 774492. Meet at North Street car park, Lewes, 9.30am. MID SUSSEX RAMBLERS: Pub Social at The Jack and Jill, Clayton, 7.30pm. SOUTHWATER HORTICULTURAL SOCIETY: Composting. Why and how? Plus other useful upcycling and recycling information. Everything you ever wanted to know about producing the wonderful, crumbly loam from kitchen and garden waste. There will also be helpful advice on ways to recycle and upcycle from the folk at WSCC and a promise of freebies. 7.30pm, The Village Hall, Church Lane, Southwater. Non members welcome, £1. Free to members. Membership £7.50 or join at the door. Email southwaterhs@yahoo.co.uk. SUSSEX MILITARY HISTORY SOCIETY: The RAF in the Cold War by Rob Martin (SMHS) 7.30pm for 8pm White Hart Hotel, Lewes. TALK: East Sussex and the End of the First World War by Dr hris Kempshall, 5.30pm The Keep, Falmer. THINKTANK: Antibiotics: How to use them wisely by Sarah Pitt, 7.30pm Christ Church, Prince Edwards Road, Lewes. WALK: Meet 10am in the car park of The Bull Inn, at Mock Bridge (about 3 miles south of Cowfold along the A281 through Shermanbury or about 1½ miles north of Henfield (BN5 9AD). 6-mile HDC walk, mostly flat (some stiles). Superb views of the South Downs. No dogs. 2½ hours. Mike 07855 502023. JAZZ CAFE: £9, 8pm Pavilion Cafe Bar, Marine Parade, Worthing 01903 206206. Robert Fowler (tenor saxophone). SOME GUYS HAVE ALL THE LUCK: £20-£21.50, 7.30pm Devonshire Park Theatre, Eastbourne (01323) 412000. Celebrating the career of Rod Stewart. MAD ABOUT MOVIES: £16.50, 7.45pm The Hawth Theatre, Crawley (01293) 553636. The story of the Hollywood Musical. THE NUTCRACKER: £19.50-£21, 5pm Chequer Mead, East Grinstead (01342) 302000. Vienna Festival Ballet. THE WIZARD OF OZ: £14-£6, 7.30pm until Oct 20 (Thurs/Sat mat 2.30pm) White Rock Theatre, Hastings (01424) 462288. TRENCH BROTHERS: £12, 7pm Brighton Dome (01273) 709709. A new Musical Theatre work. MATT’S COMEDY CLUB: £8-£10, 8pm Pavilion Theatre, Marine Parade, Worthing 01903 206206. Andy Kind plus support. PAUL FOOT: Image Conscious. £14, 8pm Komedia, 44-47 Gardner Street, Brighton 0845 293 8480. PHILL JUPITUS: Juplicity. £17, 8pm The Royal Hippodrome, Eastbourne (01323) 802020. GOOD MIDLIFE VIBES MENOPAUSE MEETUP: Have a cuppa and a cake to raise awareness and celebrate World Menopause Day. All welcome. 10am-12.30pm, Bill’s Restaurant, Market Square, Horsham. For further information please email sharonvibert@hotmail.com or see the Facebook page – www.facebook.com/goodmidlifevibes. POLEGATE RAMBLERS: Local Paths and Twittens, 2.5 miles with Sandra 483991. Meet at Polegate/Wannock rec 10am. A Tale of Two Towns, 6 miles with Ted 484923. Or, Sedlescombe, Battle, Netherfield Circular, 10.5 miles with Peter 01424 844219. Meet at Wannock Road Recreation Ground, 9.30am. PURPLE COMEDY NIGHT: £4-£5, 7.30pm, Purple Playhouse Theatre, 36 Montefiore Road, Hove, 07736 273 402, www.purpleplayhousetheatre.com. Headliner Sami Stone, MC Carl Carzana. ABBAMANIA: £23.50, 7.30pm Chequer Mead, East Grinstead (01342) 302000. Celebrating 40 Years of Abba. ANCIENT SHAPES: £10, 7.30pm Lewes Con Club, 139 High Street, Lewes 01273 473076. Tickets from www.wegottickets.com or Union Music Store. CLIFF RICHARD: From £78.08, 7.45pm Brighton Centre 0844 8471515. 58-18 =60th Tour. THE FEELING: £25-£35, 8pm De la Warr Pavilion, Bexhill (01424) 229111. Playing Twelve Stops and Home in full. THE UNDERCOVER HIPPY: £9-£10, 7.30pm Komedia, 44-47 Gardner Street, Brighton 0845 293 8480. JASON DONOVAN: £26, 7.30pm Devonshire Park Theatre, Eastbourne (01323) 412000. Jason Donovan and His Amazing Midlife Crisis. SLEEPYHEAD: £5-£7, 11.30am/1.30pm until Oct 20, Brighton Dome (01273) 709709. Little Angel Theatre. Duke Of York’s (0871 902 5728): First Man (12A) 1.15, 4.15, 7.15, 10.15; Sat 12.30, 3.30, 6.30, 9.30; Sun 2.30, 5.30, 8.30; Mon 1.00, 4.10; Tue & Thu 9.00; Wed 3.00, 6.00, 9.00; HOH Subtitled: Tue 12.00; Thu 6.00; Silver Screen: Tue 3.00; Thu 12.00, 3.00; Big Scream: Wed 12.00. Kids’ Club: The Little Mermaid (U) Sat 10.30. Toddler Time: Hey Duggee Programme 17 (U) Mon 11.30. Alien (15) Sun 12.00. Royal Opera House Live: Mayerling (12A) Mon 7.15. They Shall Not Grow Old + Satellite Q&A – 3D (15) Tue 6.00. Orion (01444 243300): Cliff Richard Live: 60th Anniversary Tour (U) Fri 8.00. Johnny English Strikes Again (PG) Fri 3.00, 5.00; Sat & Sun 12.15, 3.00, 5.25, 7.45; Mon-Thu 5.15. 7.35. A Star Is Born (15) Fri 4.30, 7.30; Sat & Sun 1.00, 4.15, 8.05; Mon-Thu 5.00, 8.05. New Park (01243 786650): The Wife (15) Fri 12.45, 6.00; Sat 12.45, 3.30; Sun 1.15, 5.45; Mon 12.00, 5.00; Tue 3.45, 8.45; Wed 1.15, 6.00; Thu 12.15, 5.15. BlacKkKlansman (15) Fri 3.00; Sat 5.45; Sun 8.00; Mon 2.15; Tue 12.45; Wed 8.15; Thu 2.30. A Prayer Before Dawn (18) Fri 8.30; Sat 8.45. Neorealism: The New Italian Renaissance (PG) Sat 10.00. Swimming With Men (12A) Sun 3.30; Tue 6.15; Wed 3.45. Royal Opera House Live: Mayerling (PG) Mon 7.15. Oscar Wilde Live Encore: The Importance Of Being Earnest (PG) Thu 7.45. Arts Centre (01483 278000): Royal Opera House Live: Mayerling (PG) Mon 7.15. Book Club (12A) Wed 8.00. The Hawth (01293 553636): Grease Sing-A-Long (PG) Sat 7.30. Royal Opera House Live: Mayerling (PG) Mon 7.15. Curzon (01323 731441): First Man (12A) 2.00, 4.50, 7.45. Johnny English Strikes Again (PG) 2.10, 5.10, 8.10. The Wife (15) 2.05, 5.05, 8.05. Eastbourne Film Society: My Life As A Courgette (PG) + Magnus (U) Wed 2.05, 7.30. Scott Cinemas – The Atrium Cinema (01342 321666): Royal Opera House Live: Mayerling (12A) Mon 7.00. Silver Screen: The Leisure Seeker (15) Wed 10.10. Pavilion (01323 841414): HOPS Classic Film: The Greatest Showman Sing-A-Long (PG) Sat 2.30, 7.30. Spitfire (PG) Sun & Tue 7.45. The Children Act (12A) Wed & Thu 2.15, 7.45. Clair Hall (01444 455440): Peter Rabbit (PG) Wed 5.15. Three Billboards Outside Ebbing, Missouri (15) Wed 7.45. The Capitol (01403 750220): Johnny English Strikes Again (PG) Fri 2.15, 5.15, 7.30; Sat 12.30, 3.00, 5.15, 7.45; Sun 11.30, 6.00, 8.15; Mon & Thu 2.15, 5.15, 7.45; Tue 12.30, 3.00, 7.30; Wed 2.15, 4.30, 7.30. Smallfoot (PG) Fri & Tue-Thu 11.15, 1.45, 4.45; Sat 2.15, 4.45; Sun 11.15, 5.15; Mon 11.15, 1.45, 4.45. Cliff Richard Live: 60th Anniversary Tour (U) Fri 8.00; Sun 2.00. Family Film Fun Screening: Peter Rabbit (PG) Sat 10.30. The Last Witness (15) Sat & Sun 7.30. NT Encore: King Lear (12A) Sun 2.00. Faces Places (12A) Mon 7.30. They Shall Not Grow Old (15) Tue 6.00. Peterloo With Live Q&A Via Satellite (12A) Wed 6.45. The Last Witness With Post Screening Q&A (15) Thu 7.30. Depot (01273 525354) (lewesdepot.org): First Man (15) Fri, Sat & Tue-Thu 2.00, 5.00, 8.00; Sun 2.15, 5.00, 8.00; Mon 1.00, 4.00, 8.00. A Star Is Born (15) Fri, Sat & Thu 2.15, 5.15, 8.15; Sun 11.00, 5.15, 8.15; Mon 2.00, 5.00, 7.45; Tue 1.00, 3.30, 8.15; Wed 3.45, 5.30, 8.15. Blindspotting (15) Fri-Sun & Thu 8.30; Mon 5.15; Tue 12.00; Wed 1.15. The Wife (15) Fri & Tue 4.00; Sat 6.00; Sun 5.45; Mon 3.00; Wed 3.15; Thu 5.45. Britain On Film: Black Britain (12A) Fri 6.15; Sat 4.00; Sun 3.00; Mon 12.45; Wed 1.00; Thu 3.15. They Shall Not Grow Old – 3D (15) Tue 6.15. Peterloo (12A) Wed 6.45. Royal Opera House Live: Mayerling (12A) Mon 7.15. Gladiator (15) Sun 2.00. The Seventh Seal (PG) Wed 11.00. Whale Rider (PG) Sat 11.00; Sun 12.00; Relaxed: Sun 12.00. Seaford Community Cinema, Barn Theatre (www.seafordcinema.org): The Post (PG) Fri 7.30. The Picture House (01825 764909): Cinephile Sunday: 2001: A Space Odyssey (U) Sun 7.00. Cream Tea Classic: Sunset Boulevard (PG) Wed 2.00. First Man (12A) Fri 1.45, 4.45, 8.10; Sat 2.30, 5.15, 8.10; Sun 1.00, 5.30, 8.10; Mon & Tue 2.20, 5.15, 8.10; Wed 12.30, 3.20, 8.10; Thu 3.25, 5.15, 8.10; Parent & Baby Screening: Thu 11.00. A Star Is Born (15) Fri 2.15, 5.30, 8.20; Sat 3.30, 5.45, 8.20; Sun 2.45, 8.20; Mon 12.00, 2.30, 6.00; Tue 2.10, 5.30, 8.20; Wed 2.45, 5.30, 8.20; Thu 2.30, 6.00, 8.20; Parent & Baby Screening: Thu 11.30. Johnny English Strikes Again (PG) Fri 2.00, 4.00, 6.00; Sat 11.15, 1.00, 3.10, 6.15, 8.30; Sun 10.30, 12.30, 3.55, 6.00, 9.35; Mon 2.45, 4.45, 8.40; Tue 1.45, 3.45, 8.40; Wed 12.45, 4.15, 6.15; Thu 1.20, 6.15, 8.40; Parent & Baby Screening: Thu 11.15. Smallfoot (U) Sat 11.00, 1.15; Sun 10.50, 12.40. Hotel Transylvania 3: A Monster Vacation (U) Sun 10.40. Saturday Morning Movie: Hotel Transylvania 3: A Monster Vacation (U) Sat 10.30. They Shall Not Grow Old + Q&A With Director Peter Jackson Live (15) Tue 6.00. Peterloo + Q&A With Director Mike Leigh (12A) Wed 6.30. Royal Opera House Live: Mayerling (12A) Mon 7.15; Encore: Thu 2.00. Cliff Richard Live: 60th Anniversary Tour (U) Fri 8.00; Encore: Sun 3.00. Dome (01903 823112): A Star Is Born (2018) (15) Fri 11.45, 2.40, 5.35, 8.00; Sat & Sun 3.10, 5.10, 8.00; Mon 1.55, 4.50, 7.45; Tue & Thu 11.45, 2.35, 5.20, 8.15; Wed 11.45, 4.50, 7.45. First Man (12A) Fri 12.00, 2.30, 5.00, 8.00; Sat & Sun 2.15, 5.25, 8.15; Mon 12.00, 2.40, 5.30, 8.00; Tue & Thu 12.20, 2.40, 5.30, 8.00; Wed 12.15, 2.40, 5.30, 8.00. Goosebumps 2: Haunted Halloween (PG) Sat & Sun 10.30, 12.10. Johnny English Strikes Again (PG) Fri 2.55, 5.45; Sat & Sun 10.00, 2.55, 6.05; Mon 11.45, 5.45; Tue-Thu 3.20, 5.45. Parent & Baby Screening: A Star Is Born (15) Mon 12.00. Smallfoot (U) Sat & Sun 10.10, 12.20. Venom (15) Fri 8.30; Sat & Sun 12.35, 8.30; Mon 3.00, 8.30; Tue & Thu 11.55, 8.30; Wed 8.30. Connaught (01903 206206): A Star Is Born (15) Fri 1.30, 4.30; Sat 2.30, 5.30, 8.30; Sun 11.30, 2.30, 5.30, 8.30; Mon 12.00, 3.00, 5.30, 8.30; Tue 11.45, 2.40, 5.30, 8.45; Wed & Thu 2.30, 5.30, 8.30. Cliff Richard Live: 60th Anniversary Tour (U) Fri 8.00; Sun 3.00. Saturday Morning Pictures: Mamma Mia! Here We Go Again (PG) Sat 10.15. A Simple Favor (15) Sun 12.00; Thu 5.40. The Children Act (12A) Sun 6.10; Thu 12.10, 3.10. King Of Thieves (15) Sun & Tue 8.20; Mon 2.45; Wed 12.00; Thu 12.45, 8.20. Silver Screen: A Simple Favor (15) Mon 11.00. Royal Opera House Live: Mayerling (12A) Mon 7.15. They Shall Not Grow Old + Satellite Q&A With Peter Jackson (15) Tue 6.00. Peterloo Première Live (12A) Wed 6.30.